A Buffalo Nickel with three legs? For over three generations, the 1937-D Buffalo Nickel “three legger” has fascinated collectors and the public alike. Caused by the results of an improper attempt to repair a damaged die, many escaped into circulation before inspectors at the Denver Mint caught the error. 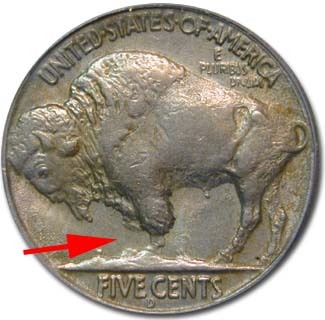 The coins’ outstanding feature is the buffalo’s missing front leg. Both stump and hoof remain, but the leg is entirely gone! That portion of the die was completely polished off so when the coins were struck, all of them were missing the right front leg. Since most of the coins reached circulation, only a few survive in new condition today. Circulated examples, depending upon condition, are worth between $400 and $1000. Perfect uncirculated coins, which are quite rare, can bring as much as $20,000 or more. -The rear leg on a genuine “three leg” will appear to have more metal gone than on the normal coin. -It will have a series of raised dots under the belly that do not appear on the normal coin. -Lastly look at the “P” in the word Pluribus and the “U” in the word Unum found on the left side of the buffalo. On a genuine “three leg,” they will be further away from the buffalo’s back than on a normal 1937-D.